Cody Blades is a civil trial and appellate attorney. She started with Madia Law in 2015 after finishing one year clerking with the Honorable John R. Rodenberg of the Minnesota Court of Appeals. Since starting with Madia Law, Cody has helped clients facing discrimination based on their gender, race, and disability fight their employers’ unlawful acts. Cody also fights for clients that have been discriminated against because they need to use Workers’ Compensation Insurance or need to take leave under the Family Medical Leave Act. Cody has also fought for clients that have been the victims of police misconduct. Since becoming a mother in 2017, Cody is especially passionate about helping pregnant women and new mothers whose employers have discriminated against them or failed to accommodate pregnancy-related physical limitations or breastmilk expression. Cody has helped Ashwin Madia try four jury trials – all of which resulted in verdicts for our clients. 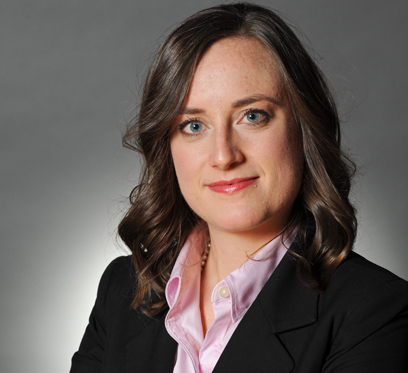 Cody is a skilled negotiator and regularly reaches favorable settlements for her clients. Thompson Reuters recognized Cody as a Super Lawyers Rising Start in 2018. This is a distinction awarded to only 2.5% of practicing attorneys based, in part, on peer nominations. Cody regularly serves as a judge for mock trial competitions and is always willing to meet for coffee or lunch with current or former Mitchell Hamline students. Cody grew-up in Richfield, MN, an inner-ring suburb of Minneapolis. Richfield gave Cody exposure to diversity on every level – race, socioeconomic background, religion, politics, and more. For example, when Cody attended Richfield High School, there were 32 different languages spoken by the student body. Before law school, Cody held many jobs – from being a server at Perkins Restaurant & Bakery for 8 years, to coaching the Richfield High School Junior Varsity Dance Team for 2 years, to working as an intern for Senator Al Franken the summer after her college graduation. After graduating from Richfield High School, Cody was the first person in her family to attend college. She attended the University of Minnesota where she earned a B.A. in Linguistics and Criminology. When Cody isn’t working on behalf of her clients, she enjoys spending time with her husband and daughter, hiking, or enjoying the award-winning parks of Minneapolis.